In the May-June 2017 issue of AZRE, Newmark Grubb Knight Frank Managing Directors Kathleen Morgan and Trisha Talbot offered their analysis and outlook on the Phoenix medical market which looks to be healthy for the near future based on decreasing vacancies,, number of closed transactions, and its investment value.. Morgan and Talbot also identified the growing trend of “micro-hospitals,” which focus on specialized services such as women’s care, cardiac, or behavioral health. These micro-hospitals not only focus on higher quality care for the patient, but also reduce costs and offer a larger profit margin for private healthcare operators. To further understand this trend, we spoke to Jokake Senior Project Manager Gonzo Gonzalez about his experience working on healthcare facilities. 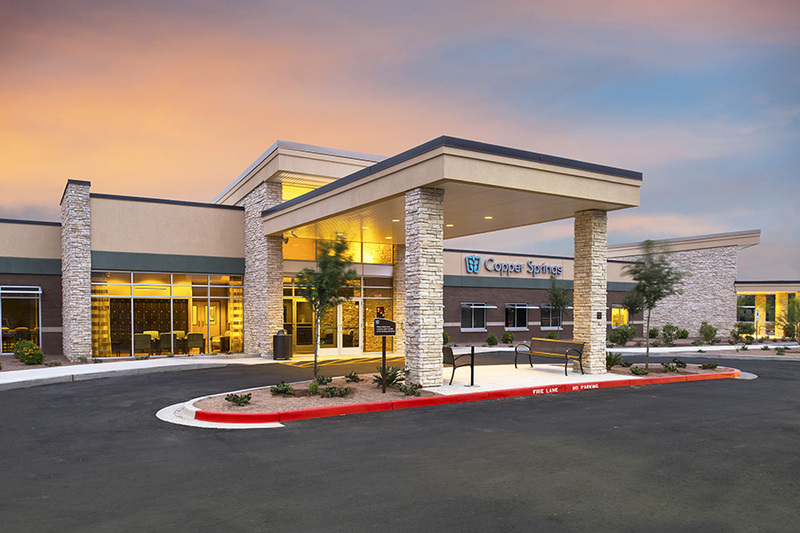 Gonzo recently completed Copper Springs, a behavioral healthcare facility in Avondale, and is starting Destiny Springs, a healthcare facility in Surprise. What’s unique about working with private behavioral healthcare operators? Beyond safety and an enjoyable experience, quality and licensing approval are especially important to private healthcare operators, especially in behavioral health. Quality – Due to the types of patients and requirements for their own safety, quality during construction is of the utmost importance. From the corners on a wall to the types of screws we use, every detail is always heavily scrutinized. Licensing Approval – A separate entity commissions behavioral health facilities with strict guidelines to ensure the safety of the patients. As we proceeded through commissioning for Copper Springs, our team compiled thorough documentation of each system, its inspector/commissioner, and the commissioning date. This valuable process helped the commissioning run smoothly, and our team achieved a perfect review for approval, nearly unheard of in behavioral healthcare facilities. I believe our success was due largely to the emphasis we placed on quality throughout construction. What is driving clients to create specialized micro-hospital facilities? Traditionally healthcare facilities have felt very institutional – lacking color, light and comfort. Clients are now thinking outside of the box to improve the aesthetics of these facilities to feel more like a residence than a hospital. High-end design touches of woods and warm colors throughout foster a healing environment that supports recovery rather than the restricting and prison-like feel of older healthcare facilities. Building a specialized, smaller facility also affords clients the opportunity to start seeing patients sooner than a traditional hospital, which creates a quicker revenue stream. How do healthcare facilities differ from office or educational construction projects? In office or school construction, there are “flex spaces” that hardly ever get used, but every square foot of a healthcare facility serves a specific purpose. In healthcare environments every space needs to be considered in light of the patient’s recovery and the care-giver’s safety and ability to do their job well. These priorities stay at the forefront of Jokake’s thinking during pre-construction and construction.